Recent news, analysis, and commentary about the Afghan conflict: security, governance, development, Resolute Support, and the ANDSF. ANDSF Losses. In a recent speech in front of an international audience – the World Economic Forum, in Davos, Switzerland – President Ghani stated that the Afghan National Defense and Security Forces had 45,000 KIA’s since 2014. The number of international casualties is less than 72; which shows who is doing the bulk of the fighting. (BBC News, Jan 25, 2019). SMW Pilot Fights Battle Online. An Afghan pilot with the Special Mission Wing flies commandos into battle and fights the information operations war online using social media. (Stars and Stripes, January 26, 2019). CN Ministry to Merge with MoI. Afghan President Ashraf Ghani has ordered the move of the Counter-Narcotics Ministry into the Ministry of Interior. the effort is supposed to result in good governance, public administration reform, greater effectiveness in CN activities, and reduction of drug demand. Australia in Afghanistan? Giving President Trump’s desire to half the U.S. troop commitment to Afghanistan and the seeming progress in peace talks it might be time for the Australians to take another look at their involvement in this long war. So says Clive Williams in “Do we still need Australian troops in Afghanistan?”, The Sydney Morning Herald, January 29, 2019. Security Company in Afghanistan Vanishes. Sabre International Security employed guards for the Canadian embassy in Kabul. When a bombing left many of their workers dead or wounded, the company vanished. Read “A Security Company Cashed in on America’s Wars – and Then Disappeared”, The Atlantic, January 29, 2019. SIGAR Report. 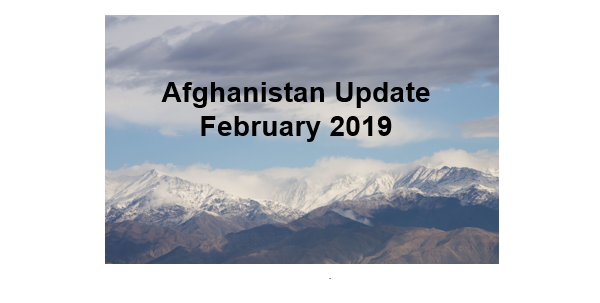 The Special Inspector General for Afghanistan Reconstruction has released it’s Quarterly Report to the United States Congress, January 30, 2019, 296 pages. America’s SFA Problem. A recent article explains why Security Force Assistance has worked out in Africa and other places. “It is too focused on building an army in the absence of a viable state that has the institutional capacity and political willpower to sustain that army.” Read “Getting American Security Force Assistance Right: Political Context Matters”, by Jahara Matisek and William Reno, Joint Force Quarterly 92, January 2019. The U.S. demand that the Taliban renounce terrorist groups like ISKP and al-Qaeda and not provide a safe haven for terrorist groups. The Taliban demand that the U.S. announce a timetable for withdrawal of U.S. troops from Afghanistan. Troop Withdrawal Plan. It would appear that some results are forthcoming from talks between U.S. representatives and the Taliban. Apparently there are some preliminary agreements related to U.S. troops pulling out of Afghanistan. Read “U.S. – Taliban Agree on Troop Withdrawal Plan”, Voice of America, January 26, 2019. “Peace Plan” or “Withdrawal Plan”? So will the Taliban keep their word? Doubtful. Will the agreement (if implemented) help the U.S. withdraw from Afghanistan? Very likely. Will it bring peace to Afghanistan? History tells us “No”. Can anyone say Decent Interval? What’s Next? A tentative agreement is just that – ‘tentative’. The talks have not included the Afghan government; some say they get a vote. Certainly the talks between the U.S. and government of Afghanistan will be interesting. What is the Pentagon saying? Acting Secretary of Defense Patrick Shanahan told reporters that there are no ongoing preparations for an Afghanistan withdrawal. But I bet there is a group of majors and a couple of colonels at Resolute Support headquarters doing a ‘deep dive’ on this right now! Countdown Begins. The candidate nomination period for the upcoming presidential elections has concluded in Afghanistan. The elections will take place on July 20, 2019. The folks at Afghanistan Analysts Network (AAN) have put together a detailed read on the upcoming elections. (23 Jan 2019). Corruption. Transparency International has released it’s Corruption Perceptions Index 2018. Afghanistan ranks number 8 in 180 nations in corruption. That means there are only 7 countries in the world more corrupt than Afghanistan. The corruption scale used is 0 to 100; where 0 is ‘highly corrupt’ and 100 is ‘squeaky clean’. Afghanistan is 16 / 100. The countries that are more corrupt than Afghanistan are Equatorial Guinea, Guinea Bissau, Sudan, North Korea, Yemen, South Sudan, Syria, and Somalia. It would appear Afghanistan is in good company. Is this a country worth fighting for? El Nino and Afghanistan. The worlds climate has a big effect on Afghanistan. How much rain and snowfall the country receives determines how much success the agricultural and livestock sectors of the economy experience. Read Afghanistan El Nino Outlook for 2019, United Nations OCHA, January 20, 2019. Pashtun Nationalism and the Taliban. Mohammed Ayoob, a senior fellow at the Center for Global Policy in Washington, DC and a professor at Michigan State University, offers his explanation of why the Taliban enjoy support within the Pasthun population of Afghanistan. He also believes that the U.S. needs to account for this support when negotiating with the Taliban. Read “Pashtun nationalism and the American withdrawal from Afghanistan”, The Strategist, Australian Strategic Policy Institute, January 21, 2019. Trump is Getting Played. Michael Rubin explains why the Taliban are winning in the negotiations with the United States. Read “The Taliban plays Trump for a fool”, Washington Examiner, January 29, 2019. CIA’s Proxy Forces. A paramilitary organization supported by the Central Intelligence Agency has done more damage than good – at least in the view of Bonnie Kristian – a fellow at Defense Priorities and weekend editor at The Week. Read “America’s War in Afghanistan: Fostering Anger, Not Security”, Real Clear Defense, January 21, 2019. Video – What’s Happening in Afghanistan?, Center for Strategic & International Studies, January 31, 2019, 4 mins. After 17 years of war, President Trump has called for the withdrawal of U.S. forces from Afghanistan. Will Kabul fall to the Taliban if the United States disengages? CSIS experts Melissa Dalton, Seth Jones, and Dan Runde explain what’s happening in Afghanistan. Waltz on U.S. Withdrawal from Afghanistan. Representative Mike Waltz, a former Green Beret with two tours in Afghanistan, is not very trusting of the Taliban. He was recently on Fox News expressing his doubts. (Jan 29, 2019). Watch the 4-min video. Video – Peace Talks Interview. Laurel Miller and Barnett Rubin chat about the prospects of peace. Miller was President Obama’s special representative for Afghanistan and Pakistan. She is now the International Crisis Group’s Asia Group director. Rubin is the director of the Afghanistan-Pakistan Program at the Center of International Cooperation. He also served in the State Department. Watch “US and Taliban peace talks make progress toward ending war in Afghanistan”, PBS News Hour, January 28, 2019. (11 mins).